Once folded, this case looks like a clutch with it's leather tab. It's sophisticated enough to be proud of and casual enough to use every day. Made to last, this case is made of sturdy blue denim and has blue and white stripes accents. This case will store your straight needles, as long as 14". There are 15 spots in the front, from small to large, and another 15 in the back. Ideal for a complete set. 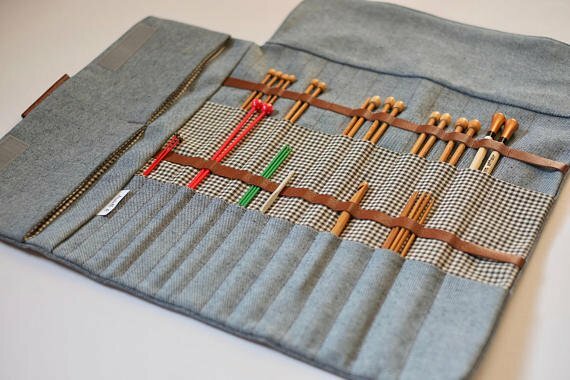 This case can also store crochet hooks and double-pointed needles (DPN's). This organizer has a side pocket separated in two sections to hold your small scissors, markers and mending needles. It has a velcro closure to secure your small notions.